Spoiler alert! Seriously, if you haven't picked up The Amazing Spider-Man #700, which came out today, but you intend to, stop reading. Also, get off the internet, because most other sites are spoiling this news directly in their headlines. Yes, as discussed in last week's article on Spidey writer Dan Slott getting death threats, Peter Parker has died in the elderly, cancer-ridden Dr. Octopus's body, while Doc Ock — who has received all of Peter's memories and a newfound desire to do good — is in Peter's body, and now intends to be Spider-Man. 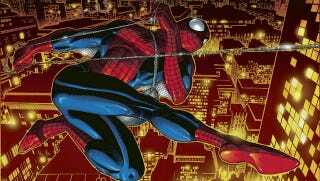 Specifically, he intends to be the star of The Superior Spider-Man, which MTV Geek has a short preview of the first issue. Of course, this means that the character of Peter Parker is well and truly gone, with no chance whatsoever of ever coming back. We all know how comics pride themselves on their realism, so to return a character from the dead in any fashion would be a gross insult to their audience's intelligence. Marvel should be congratulated for having the bravery to kill off one of their most beloved characters with no possibility whatsoever of ever returning. Yes, Peter Parker is truly gone forever. Yep. Not comin' back. Nosirree. Dead dead dead dead dead. He's not pining for the fjords; he's passed on. This Spider-Man is no more. He has ceased to be! He's expired and gone to meet his maker! He's a stiff! Bereft of life, he rests in peace! His metabolic processes are now history! Hes off the twig! He's kicked the bucket, he's shuffled off his mortal coil, run down the curtain and joined the bleedin' choir invisible!! THIS IS AN EX-SPIDER-MAN.